Texas pride is hard to explain, but easy to understand. Texas Iced Tea captures that pride with an iced tea that is refreshing, bold and full of flavor. Brew yourself an ice cold glass and toast with us to- two stepping, Friday night lights, the Alamo, country music and freedom. Texas Forever. 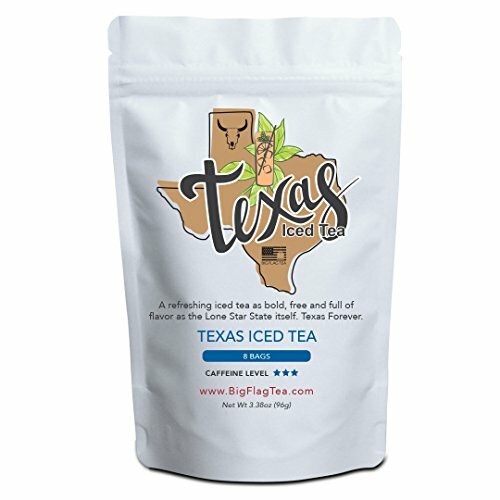 TEXAS ICED TEA - A refreshing iced tea as bold, free and full of flavor as the lone star state itself. Texas Forever. 5% DONATED TO THE TROOPS - Five percent of every sale is donated to Packages From Home a charitable organization that sends care and comfort packages to deployed American military heroes who are stationed in active duty theaters around the world. 8 PILLOW TEA BAGS - Each pouch of Florida Breeze Iced Tea contains 8 pillow tea bags. Each pillow tea bag makes one pitcher. HIGH-QUALITY MICRO-BLENDED TEA - Each tea flavor is created in very small batches to help ensure that each tea blend yields the maximum amount of flavor. This is how we help guarantee that you consistently get a flavorful cup of high-quality tea. If you have any questions about this product by Big Flag Tea, contact us by completing and submitting the form below. If you are looking for a specif part number, please include it with your message.